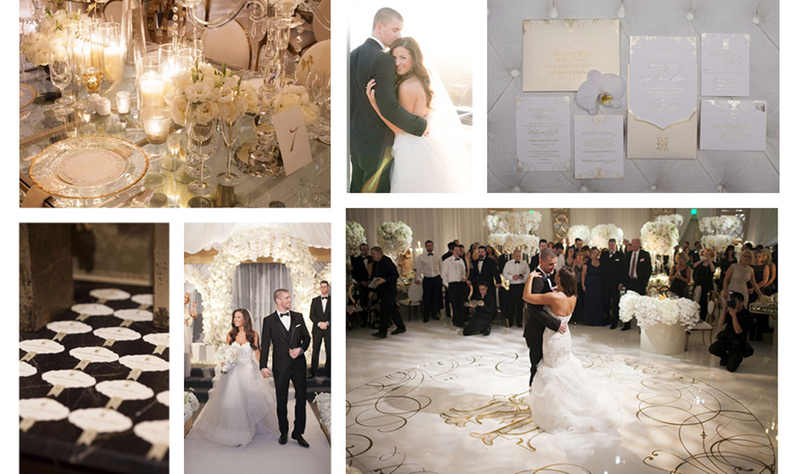 “One word comes to mind when I daydream about Lisa & Caesar’s fairytale St. Regis Monarch Beach Wedding… Glamour. Each and every detail was so luxurious and wonderful, Lisa & Caesar truly lived out every little girl’s dream day. Lisa and her bridesmaids all looked stunning, especially Lisa in her mermaid style Inbal Dror gown. The gown was adorned with ivory lace and a tulle train that looked so ethereal cascading down the staircase. At the waist was a ivory satin belt with a tiny delicate bow. blush florals placed atop mirrored pedestals. The ceremony was beautiful, elegant, and truly timeless. and mirrored table tops, those two modern elements work so well together in a feminine space to give it a little bit of edge. The cut crystal candelabras are out of this world, housing the shimmery gold candlesticks that added a hint of romance. Featuring a riff on our Miira & Giovanni lace letterpress set.